The Memorial Candle Program has been designed to help offset the costs associated with the hosting this Tribute Website in perpetuity. Through the lighting of a memorial candle, your thoughtful gesture will be recorded in the Book of Memories and the proceeds will go directly towards helping ensure that the family and friends of Russell Pryga can continue to memorialize, re-visit, interact with each other and enhance this tribute for future generations. 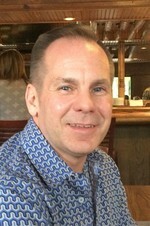 Russell “Russ” T. Pryga, 52 died unexpectedly Saturday, Sept. 30, 2017, in Chicago, IL. He was born June 10, 1965, and grew up in Mosinee, WI, the son of John Jr. and Barbara (Hollingsworth) Pryga. Volunteering and giving were a huge part of Russ’s life. He spent many hours volunteering at “GroceryLand”, a food pantry for those with HIV/AIDS, and other charitable organizations to ensure he helped make a difference to those in need. He was a Packer fan, loved his dogs, loved to travel and played in the Chicago Metropolitan Sports Association volleyball league. Everyone who came in contact with Russ experienced his generosity, kindness and compassion. He had the ability to make other people smile even when he was sad. He will be greatly missed by his family and friends. Survivors, besides his parents, John Jr. and Barbara, include his daughter, Kelly (Josh) Pryga-Ahrens, Hamel, MN; and his sister, Debbie (Kurt) Strohmeier, Saint Paul, MN. He was preceded in death by both sets of grandparents. Memorial services will be at 4 p.m., Saturday, Oct. 7, 2017, at Beste Funeral Home, Mosinee. The Rev. Marilyn Lange will officiate. Visitation will be from 2 p.m. until time of services all at the funeral home. Online condolences can be made at www.bestefh.com. In lieu of flowers, donations in Russ’s name can be directed to the American Red Cross. To send flowers to the family of Russell Todd "Russ" Pryga, please visit our Heartfelt Sympathies Store. A good man the “old-fahion-way”.